With a week to go until BBL|06 starts, here are the sample teams you need to see. With a week to go until the season starts, here are a few sample teams designed to show you the variety of strategies you can try for this BBL Fantasy season. Let’s get straight into them. Click here for BBL Fantasy for beginners. Click here for projected XIs. Click here for underpriced gems. Click here for players to avoid. Click here to to join the dreamteamtalk.com group. This team is your standard guns and rookies strategy, which is usually quite effective in BBL Fantasy. Grab six of the most expensive players who you think will score well and then fill the remaining spots with rookie players. I recommend having three of the six as bowlers because there’s less rookie depth there. You batting line should look strong, but you might have to compromise a bit with the bowlers. This is a very similar team except we’ve given up some wicketkeeper strength to upgrade our bowlers. It’s not a pure guns and rookies strategy, but it gives you a much more reliable bowling unit. At the same time, your bench is still pretty weak – but that’s the price of such a strong on-field team. This team is made up entirely of players who have two games in round one (Thunder, Sixers and Strikers). While it seems impractical – and, you know, it sort of is – with 21 trades and three allowed to be made per week, you could attempt a gamble like this. Maybe be a bit more practical with your bench than I was, but this is certainly a way to go for the overall round winner. The biggest risk here is having too many players from the one team. There’ll always be players that fire and those that flop and you’re basically guaranteeing a little of each with this strategy. You just have to hope they all fire once. If there were statistics about who the most picked players were right now, this lot would probably be right up there. It’s a very strong team, but not a team that you’re going to win the competition with. You’ll need your own points of difference to win and while having a few of these players is good, try to vary it up. Having said that, a team like this really doesn’t have any other weaknesses. Okay, here’s my team. STOP JUDGING ME. I change my team so often it could be completely different in a week’s time, but I’ve tried to balance picking the obvious players with those in-form or under-priced. It was a struggle to not pick a team with like seven Scorchers players in it. Go on, pick it apart, I’ll fight you all. 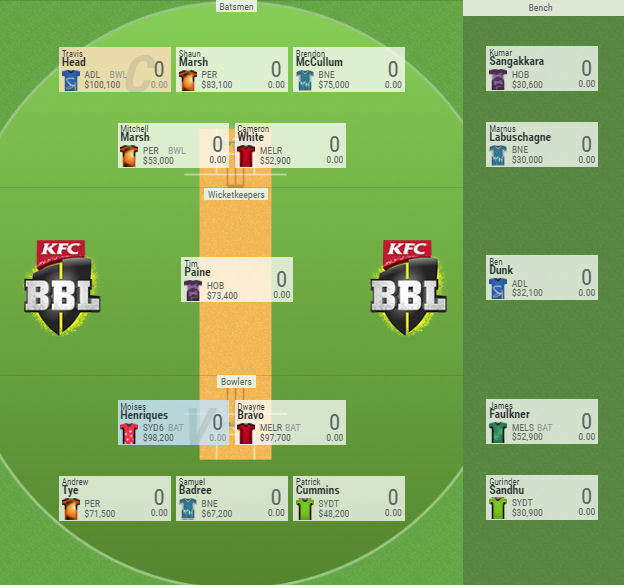 Who is the one player in BBL Fantasy that you think is a lock across all teams? Leave your thoughts in the comments and post your teams if you want! Not sure if he’ll be fit for round 1. I’ll target him later in the season. Isn’t head out for aussie team as well as cummins? abd mccullum due to injury? I think the locks to have are Russell, Head, Haddin, Henriques, Marsh and Cummins. Hey Nic, which batsmen should I get out of Blizzard, Patterson or Harris? And do you think Cartwright will play? I’d say Patterson, but Harris could bat higher. Cartwright might get a game with all the Scorchers’ injuries. Yeah i’ve already changed that up. Don’t want to overload on them, but 3 isn’t enough. Marcus Stonis as a POD? Why as a POD, is he not starting ? I think Stoinis is flying under the radar a bit, but I think there are better options in the price range. That might make him an excellent POD! Remember, Stars have the round one bye. I have no idea what I’m doing with this, which players are good or anything like that, so I’d love some thoughts on this team. What can I change? What can I do better? The only Stars player you can get away with on your bench is probably someone like James Faulkner who’s only 50k. Bench him and play Sandhu/Cummins. If you started with a Faulkner/stoinis combo on your bench then you could use them as a captains loophole. if you have to players on your bench that are playing you can’t do that because you can’t set an emergency so you get the lower of the two scores, but if the other player on the bench doesn’t play then you get a loophole opp. You can also use this tactic if a guy in your bench does really well and you want to take his score. I reckon wait till round 3 to bring him in. Scorchers have a DG and you’ll get to see whether he’s performing. Nic, does this team look alright? Any thoughts or suggestions are welcome. white, ferguson, harris, blizzard, burns or anyone else for the field. I’ve made a few changes. My team now looks like this. I’d love your thoughts. I heard KP won’t play the first few rounds for the Stars.Is this true? Should I trade him just in case or what? The stars have the bye in round 1 for fantasy anyway so its not worth paying the money for KP to sit on your bench to start with in my opinion. Who are the best options to get at 81k and lower as a batsmen or bowler? When can we trade a player ? And is there a limit on how many trades we can do per trade period ? How does this look ? Who can I change ?